Does the thought of using a cleaning schedule make you want to curl into a ball and never turn on the vacuum? I’ve been using a cleaning schedule for years. While I’ve had a love/hate relationship with cleaning schedules in the past, I finally found one that worked for me: my own version of a cleaning schedule! The thought of creating (and using) a schedule or routine of any kind might seem daunting, restrictive, and like it’ll take more time than it’s worth. I spent years of either forgetting or ignoring tasks (like dusting the entire upstairs of my house). Then there were the days when I would spend an entire Saturday morning brainstorming everything I needed to do and creating list after redundant list before finally realizing that I had wasted my entire cleaning time. 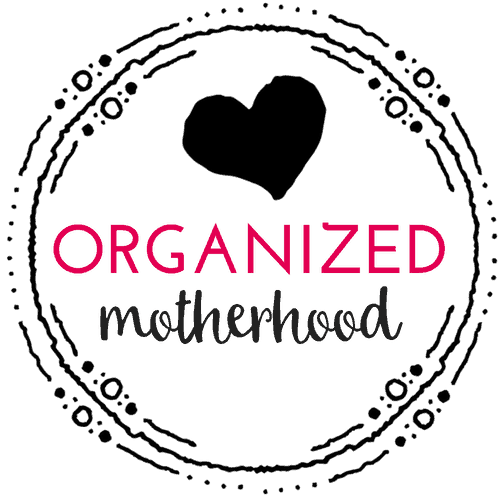 I finally broke down and accepted that my current cleaning plan (or lack of a cleaning plan) just wasn’t working. Why should you keep reinventing the wheel?!? 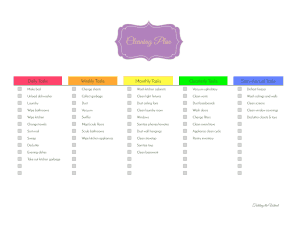 By using a checklist, you’ll always know what you still need to accomplish. It’s also handy so that you can see at a glance what you’ve already done. When you have some spare time (or when the kids need to burn off steam), mark off things like “dusting the baseboards.” Then, when you’re frantically trying to get ready for Christmas or your child’s birthday party two weeks later, you can easily see that the baseboards are done and you have one less thing to do. Chances are, you’re probably already using some sort of cleaning schedule, even if you don’t realize it. Do you typically dust, then vacuum? Do you sweep your floors before scrubbing them? Do you pick up your kids’ toys every night before bed? 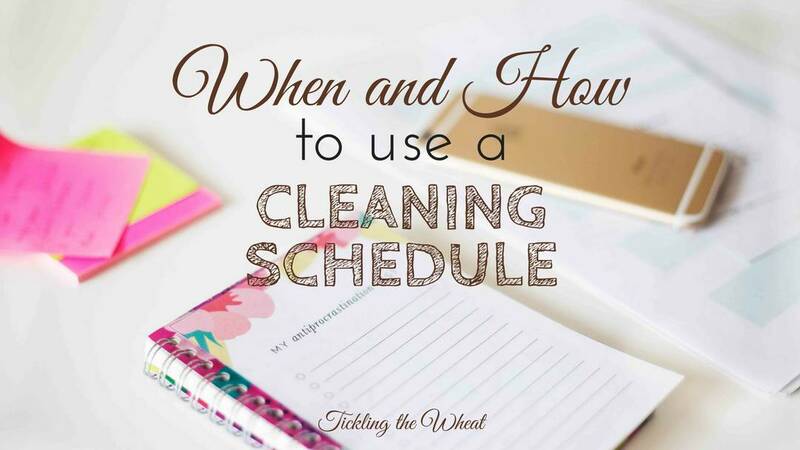 The purpose of creating a cleaning schedule is to document what you already do (and what you might forget to do) on a regular basis. Think about how you clean your home (both regularly and when you deep clean). Do you like to clean one room from top to bottom? Or, are you more efficient when you do all the dusting, then all the vacuuming, etc.? 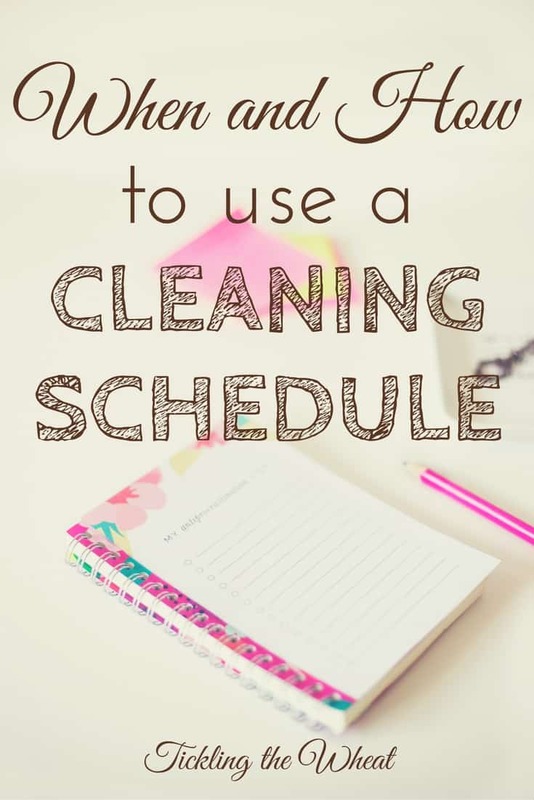 To create a cleaning schedule, think about everything you need to clean in your house. Go from top to bottom, and write everything down. Don’t forget to list things like dusting the light fixtures and lamps or wiping the light switches and remotes. 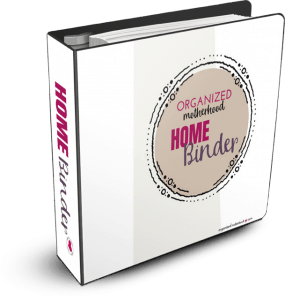 Next to each item on your list, write the frequency that you’d like to do each cleaning task. Note that this can change as your life changes. I used to only clean my kitchen floor once a week, but now that I have kids, I have to sweep and spot clean daily, mop it once a week, and scrub it or steam it once a month. 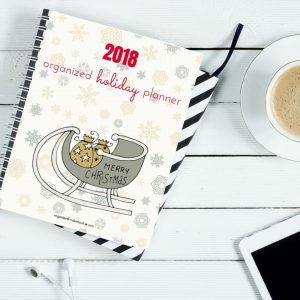 Now that you’ve thought of everything you regularly do to clean your home (daily and weekly tasks) and everything that you might want to include (monthly and quarterly things), it’s time to make sure that you’re not forgetting anything!